The original recipe is from the book, True Foods by Andrew Weil MD. I have modified it by using our exceptional quality extra virgin olive oil and aged balsamic vinegar adding a creative flavorful twist. Process until smooth and set aside to stay cold put in the refrigerator until ready to serve. Store any unused portions up to 3 days. In bowl, whisk the eggs until smooth. Add bread cubes let soak for 3 minutes. In large oven proof skillet, heat the olive oil on Medium High heat. Add leeks sauté until softened. Add asparagus sauté for about a minute. Add egg mixture to leeks and asparagus in skillet. Reduce heat to Medium and stir in Cheese and Cabbage. Put in Oven uncovered, bake for 20 minutes or until set. Let rest for 5 minutes before cutting in sections. Servings 4 – 6. 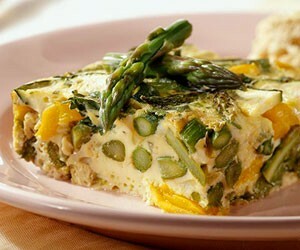 Place quiche on top of tender greens then top the quiche with 1 Tablespoon of Caraway Tofu Cream. Grind a bit of Makai Celtic Sea Salt and Fresh Ground Pepper on top seasoning to taste. Drizzle a little Extra Virgin Olive oil over the greens.